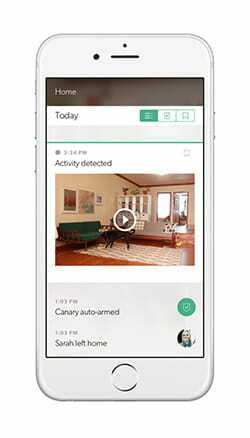 Canary Reviews: Can This Device Stop a Burglar? Canary is a DIY security device that records footage and monitors air quality, temperature, and smoke. Canary can be used as a single device, or you can connect multiple Canary devices to monitor an entire home through the app. We have tested Canary out ourselves and are excited to share our experience with you. Canary is an all-in-one home security system controlled from your smartphone app. It sends alerts to your device with HD video and audio. It can also send alerts to your Apple Watch. Once you are alerted you can sound the alarm, contact the police or ignore it if it’s nothing to worry about. Below are some of the key things Canary can do to help monitor your home. The Canary is sturdy and doesn’t feel like it’s made out of cheap plastic. It has a cool-looking light on the bottom that glows to signal what mode the Canary is in. It fits comfortably on a tabletop or book shelf, but note that this camera must be plugged in at all times. So it can be difficult to conceal. While the glowing lights are cool, it could also draw attention to a burglar and tip them off to the camera. However, if you place this by your TV it blends in well and appears like it’s just some type of gaming system. Canary offers 24/7 phone customer support, which we love. If you do experience a hiccup, it’s good to know that Canary is available at any time to help if needed. They also offer email and live chat support in addition to a Help Center and FAQs. So whatever your preference is, Canary has got you covered. We never had a reason to contact customer service, but according to customer reviews, users are pleased. Canary users have described their customer support experience as professional, responsive, good, fantastic, and more. Of course, there are instances where the customer service is described as less than stellar but overall, the reviews are positive. Before purchasing a Canary, make sure you have the following technical requirements. You can purchase a single Canary camera for $199 or a Canary Two-Pack for $379. Canary offers four different storage plans according to how long the footage is saved before it’s deleted. For example, the 12-Hour plan shows video history of the past 12 hours, not 12 hours total of footage. Below is a list of things that come when you purchase a Canary. Below are the specifications for the Canary including view angle and dimensions. We were astounded by the quality of video the Canary provided. We tried installing it in a second place but had difficulties getting it past the “Updating Canary” section. Perhaps the internet connection wasn’t as good—we’re not quite sure, but it also could be a flaw in the Canary. Overall we were pleasantly surprised by the video quality. The app was simple to use and the device isn’t gaudy looking. In fact, it has a glowing light that beams below it and someone who visited our home thought it was a techy diffuser when they saw it. So hopefully burglars think that’s what it is too! Is Canary better than other DIY options? We are thrilled with the video quality and app performance of the Canary but there are a couple other DIY options we consider to be better. Since Canary doesn’t have door or window sensors and no battery backup we still prefer SimpliSafe. Do you think Canary is enough to stop a burglar?